Verilux Back to School Sweepstakes – Win a $100 Amazon gift card & more! Win a $100 Amazon gift card & more! ENTER SWEEPSTAKES HERE – Verilux Sweepstakes page. ENTRY LIMIT – You may enter only once. ELIGIBILITY – Sweepstakes is open only to those who sign up at the online sweepstakes page and who are at least 13+ years old at the time of entry. SWEEPSTAKES ENTRY PERIOD – Entries will be accepted online starting on or about August 20, 2018 at 9:00 AM and ending August 31, 2018 at 11:59 PM EST. PRIZES – The approximate retail value of all prizes is approximately $450 plus the cost of shipping (shipping cost varies based on location and will be covered in the U.S. & Canada by sponsor and partners). 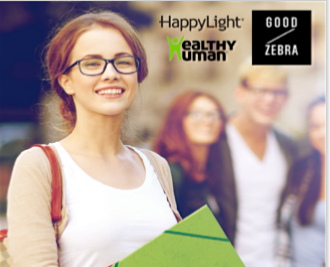 The prizes are: 1 HappyLight® Lucent LED Energy Lamp, 1 SmartLight LED Desk & Table Lamp, 1 Prize Pack from Healthy Human, 3-Month Protein Animal Cracker Supply from Good Zebra, and 1 $100 Amazon Gift Card.